These cookies are very easy to make and you can freeze one of the dough logs for later – but I don’t think that’s gonna happen. Honestly. Sift the flour, salt and baking powder into a medium bowl and poppy seeds together. Put the sugar in a medium size bowl, add the orange zest and use the tips of your fingers to rub them together until sugar is fragrant. Using an electric mixer, preferably fitted with a paddle attachment, beat the butter at medium speed for a minute or so, until smooth. Beat in the fragrant sugar and zest and continue to beat for about 2 minutes until mixture is light and pale. Add the egg and yolk and beat for another minute or two. Beat in the vanilla. Reduce the mixer to low speed and steadily add the flour mixture, mixing only until it has been incorporated. Because the dough is best when it is worked the least, you might want to stop the mixer before the flour is thoroughly blended into the dough, and finish the job with a rubber spatula. When mixed, the dough will be soft, creamy and malleable. Turn the dough out onto the counter and divide in half. Shape each half into a chubby sausage - about 5cm (2in) in diameter* - and wrap in baking paper. The dough must be chilled or at least two hours. Well wrapped the dough can be refrigerated up to 3 days or frozen up to 2 months. Center the rack in the oven and preheat oven to 180ºC/350ºF. Line two baking sheets with parchment paper or silicone mats. Use a sharp, thin knife to slice into 6mm (¼-in) thick rounds, and place the rounds on prepared baking sheets, leaving a little over 3.5cm (1 ½-in) of space between them. Bake the cookies one sheet at a time for 9 to 11 minutes, rotating the sheet at the midpoint. The cookies should feel firm, but they should not color much, if at all. Remove the pan from the oven and let the cookies rest 1 minute before carefully lifting them onto a rack to cool to room temperature. Repeat with the remaining dough, cooling the baking sheets between batches. What is it about poppyseeds that makes everything look and taste so wonderful? Oh! 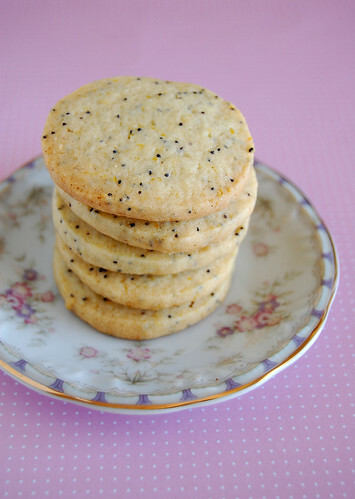 These orange cookies with poppy seed look so yummie! I'll definitely try to make them. Nice pictures as well. These look perfect. I love poppyseeds in anything. A perfect tea cookie! I love orange poppy seed cake but have never seen cookies! They must be delicious and they look gorgeous too. Wow. It looks amazing and yummy. Good recipe. Looks delicious. I am surely gonna try it. Poppy seed is rich in B-complex. It is also very useful for health, for those who have sensitive skin, dandruff, hair-loss, it aids in mental alertness. Those who suffer from vertigo feels relief, it relieves skin dryness etc. I love these and must give them a try! I love baked goods flavored with orange. Juliana, thank you for stopping by! Hope you like them! Pease Pudding, I think you will like these, then. Tks for visiting! Poppy Seeds, I did not know that, tks for sharing! You make such pretty cookies! These would be just great for teatime. And I like the idea of freezing some dough for a quick fix later. Lovely. Never apologise for baking with citrus. Divine! 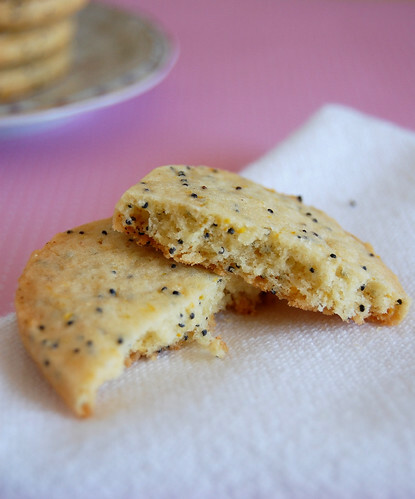 poppy seeds in cookies.....cant imagine how crunchy they are! delicious! The recipe sounds wonderful, but I'll let you in on a little cookie baking trick I learned from my Mom. Use 2 oven racks. bake until shiny on the bottom rack and then turn the cookie sheet around and put on top rack. This makes them bake more evenly. The bottom shelf heats from the bottom and the top shelp from the top. I tried baked these cookies tonight and they are delicious. Thank You for posting the recipe.